We have also received the HOSCARS award for 2016 and 2017 for “The Most Popular Hostel in Chiang Mai”. At Hug Hostel Rooftop you can find a great social atmosphere and a reception which is available 24/7. Here you get to meet fellow backpackers and socialize at our rooftop bar where you can enjoy regular parties as well as a stunning view of Doi Suthep Mountain. In more than 2000 reviews between our old and new branch we received a 90% approval rating from our guests. We offer both a great open atmosphere and the possibility to party the night away on our rooftop terrace where you can enjoy drinks, music, and the company of fellow travelers. Meanwhile, we always make sure to create a balance between party and day trip tour guests, so that guests who attend our parties do not disturb those who are sleeping in the rooms. This way all our guests can wake up fresh and rested in the morning to enjoy our various day trip offers, such as cooking classes, Elephant Sanctuary visits or jungle trekking, for an unforgettable stay in Chiang Mai. We also make security our main priority so our guest always feel safe and comfortable during their stay. Located at the heart of the old city at Chang Phuak Gate, nearby Saturday and Sunday night market, our hostel is on the main road just around the corner from some of the most famous street food stalls of the city, such as the Lady with the Cowboy hat or the popular Khao Soi Khun Yai, where you can taste traditional northern curry noodle soup. The hostel is also only a 5 minute walk away from the popular North Gate Jazz Bar and a 15 minute walk from Warorot market. If you want to enjoy the nightlife of Chiang Mai you can do so at one of the most well-known clubs of the city, Zoe in Yellow, which you can reach within 10 minutes. Other tourist spots, such as the Three Kings Monument, Wat Chedi Luang and Tha Pae Gate are also in close proximity to the hostel and can easily be reached by foot. 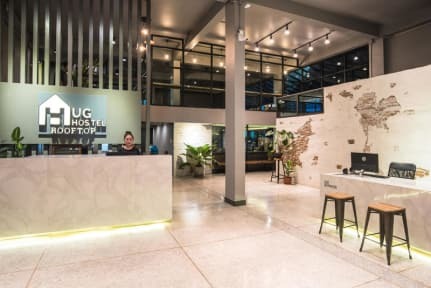 At Hug Hostel Rooftop you will find comfortable beds in air conditioned dormitories and private rooms as well as clean and spacious bathrooms where you can enjoy hot showers and enough space for you to get ready for the day. We also have a restaurant on site which offers delicious breakfast, Thai food, coffee and smoothies. We use a key card access system to make sure that you can always feel safe and comfortable even if you are not at the hostel, so you can enjoy your day trip or your night out in the city. All of the private rooms come with an en-suite and the dorm rooms are furnished with bunk beds and comfy mattresses with linens. Each bed comes with a private reading light, power socket and a big locker where you can store your belongings. You can find a spacious shared bathroom on every floor and towels are available for rent at the reception. This hostel has everything you can wish for! To begin with, when you check in, the staff is more than just friendly, they will do whatever they can to make your stay the best experience, such as helping you make plans. The rooms are very big, I stayed in a 4 bed female room with a key card area access. There is plenty of space to store your luggage in the locker. The showers are clean and decent. Entertainment room is superb for relaxing and meeting people. Nice Rooftop bar! So glad to have found this beautiful hostel. The design is amazing and looks exactly as it does in the pictures! The beds are comfy and all the rooms and facilities are clean. The location is perfect- central within walking distance to all Chiang Mai main attractions. Rooftop bar is simply amazing! They have happy hour offers and a perfect spot to watch sun-set. Great place to stay! Staff are super helpful when booking tours (elephant sanctuary is a must!!!) and great suggestions for things to do. It’s a short walk to the old city and there’s a mini food market nearby. It’s a very social hostel and as a solo traveler it was easy to meet people. Would definitely stay here again! Was here for the last night of songkran - good vibe. Rooms are clean and well kept, along with the bathrooms. Common room and restaurant haven’t got AC so not great spaces in 40 degree heat, but the rooftop bar had a good atmosphere in the evening. Did the elephant sanctuary the hostel recommended and really enjoyed it - they get a discount too! Value for money and would stay here again. Clean and comfortable. Rooftop bar was great and it was easy to meet people. However on the 4th floor the walls were really thin so it could get noisy. Close to the northern wall. The hostel has everything you need for a stay in Chiang Mai. Really close to the Old City where most of the points of interest are, plus the beds and rooms are comfortable and spacious with a big locker for belongings. There were always people milling about and the rooftop bar has happy hour every night which was a great way to meet new people in a casual environment. The café downstairs was also really good, a little higher than street food prices but great quality. The rooftop bar is nice but other than at happy hour very little atmosphere in this hostel. The air conditioning didn’t work in our room and the entire hostel including hang out spots was sooo hot. Beds were comfortable and there are large lockers for storing your things. Overall meh! Really nice roof bar with real potential and views of the city! Bathrooms could have been cleaner, most of the showers were blocked. Air con in rooms didn’t work so over all rooms were incredibly uncomfortable due to heat. Might have been timing but not an overly socialable hostel.